It’s time to move past the limitations of your legacy infrastructure, even if your budgets and resources are tight. Hyper-converged infrastructure (HCI) is the best building block for the software-defined data center—and it’s where organizations like your’s are seeing massive savings in time and costs. 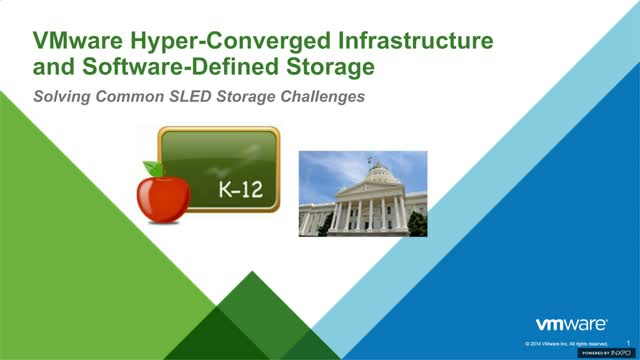 Join us for an informative webcast and learn why VMware hyper-converged software, including the radically simple Virtual SAN hyper-converged storage, makes sense as part of an HCI strategy, no matter the size of your environment and data footprint—or its performance needs..
We’ll share success stories from your peers, highlighting how they have dramatically improved performance, reduced latency, increased VDI scale, saved capital costs and more. If you’re ready to explore the next step toward a software-defined data center, this webcast will give you a good start.